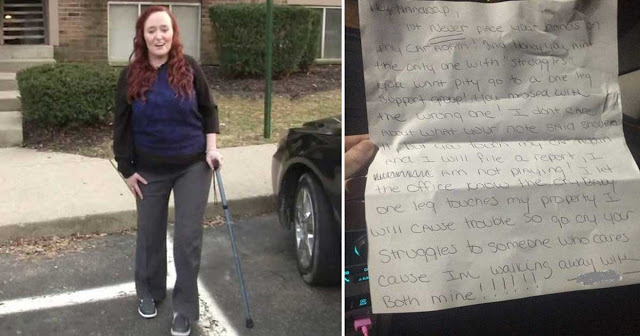 A woman in Ohio asked her neighbor not to park in her handicap parking space. The neighbor proceeded to respond with the most shocking letter ever. 26-year-old Ashley Brady lost her leg in an accident this past year and has been struggling to walk with a prosthetic limb ever since. Brady eventually asked management of her apartment complex to create a handicap parking space for her so that her walk to and from her car would be much easier. The spot was completed, and within minutes of its completion, a neighbor wasted no time in trying to take advantage of it. This prompted Brady to leave a note on her neighbor’s car stating that the spot was a reserved spot. Brady also explained to the neighbor why she needed the spot and that it was difficult to walk on one leg. The letter below was the neighbor’s response to Brady’s note. Since the incident, Brady has shared the letter on Facebook where it has spread like wildfire. 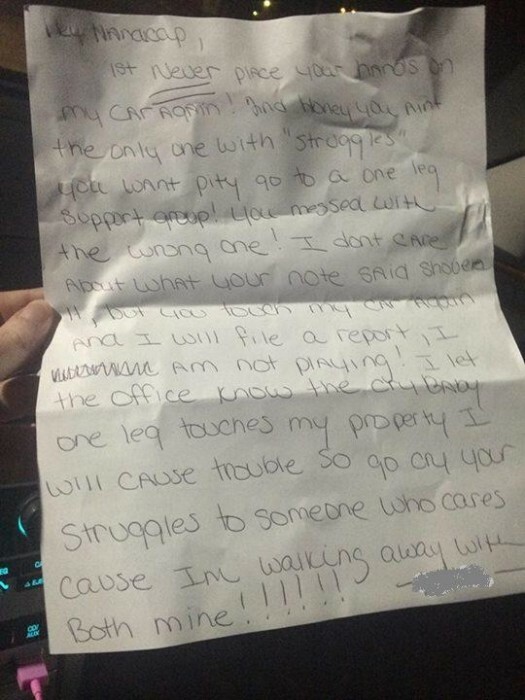 She’s also complained to the apartment complex’s manager as well as filed a complaint with the police.